Learn something new every day. This is my mantra in life. It doesn’t matter how small the thing you learn is, what matters is that you progressed and expanded as a person. It keeps you moving forward, keeps you motivated, keeps you living. It can be as simple as doing one sudoku puzzle to keep your mind active or opening a book on your shelf to a random page and ingesting the contents, to watching a documentary or studying something in nature. It can be a meditation or contemplation on what it is to be joyful, or compassionate or even sad. Just something that increases your awareness, something that takes you out of the humdrum and bustle of your everyday chores. Something that gives you an inkling of a bigger picture. Make the time to do this … every day … for you!! At least once a day, connect with your bigger picture. Ask yourself, what is the long-term aim here, what are my ultimate goals, dreams and desires and then ask yourself, is what I’m doing right now in my job, my life, bringing me closer or further away from that aspiration? Help other people to see their bigger pictures in a non-judgemental way. It is often easier to see others than to see your own. 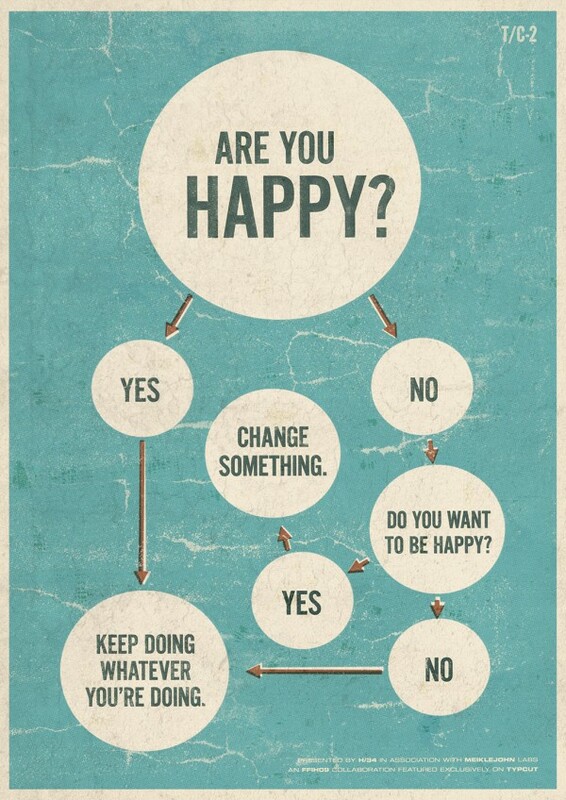 If you are not happy … change something! Anything! It can be as simple as taking a deep breath. Taking a deep breath changes your physiology, your brain chemistry and ultimately your perspective. Changing your perspective might seem to some like the smallest thing you could change but, in fact, it is the largest and most potent thing. How you choose to react to any given situation is down to you. This is applicable to everything. Ask yourself how do you choose to react to insults, compliments, pain? Don’t forget how unique you are. You are the only you! You are originally manifest into this physical reality with none of your day-to-day issues and you will leave this physical reality the same. Why do we create so much noise and complication in between these two points? It is all part of our learning and we choose how we learn. Appreciate the gift of life … and all the other blessings in your life… the food on your plate and your ability to be able to enjoy and savour it, your health, your bed, your family and friends, your mind. The day will come when your time on this physical plane is done and you don’t get an exit interview or time to summarise and complete everything you wanted to so don’t waste a precious moment doing something that makes you unhappy. Don’t do anything out of guilt or obligation! When you are happy, people around you will be happy so inspire others towards happiness by radiating happiness. Shoot for the moon and even if you miss you’ll end up amongst the stars! At least you were going in the right direction. It is important to be focused on your goals but allow yourself permission to change your mind and go with the flow if that is what your heart tells you. ALWAYS listen to your heart. If something doesn’t feel right in your heart, it isn’t right! This is the most important tool you own. Consult with your heart on a regular basis. Get to know how to read it. Following your heart can sometimes lead to heart-break, that’s okay, don’t try to protect yourself from this. Love unconditionally and you will heal fast, I promise! Tell yourself every day that you are free … and believe it … because you are free! I’m impressed, I must say. Seldom do I come across a blog that’s both educative and entertaining, and without a doubt, you’ve hit the nail on the head. advice. Perhaps you can write subsequent articles relating to this article. I have been browsing on-line more than 3 hours these days, but I never discovered any attention-grabbing article like yours. You will learn something new every day as we explore the most interesting facts and unique bits of knowledge from around the universe. Like science? Us too!